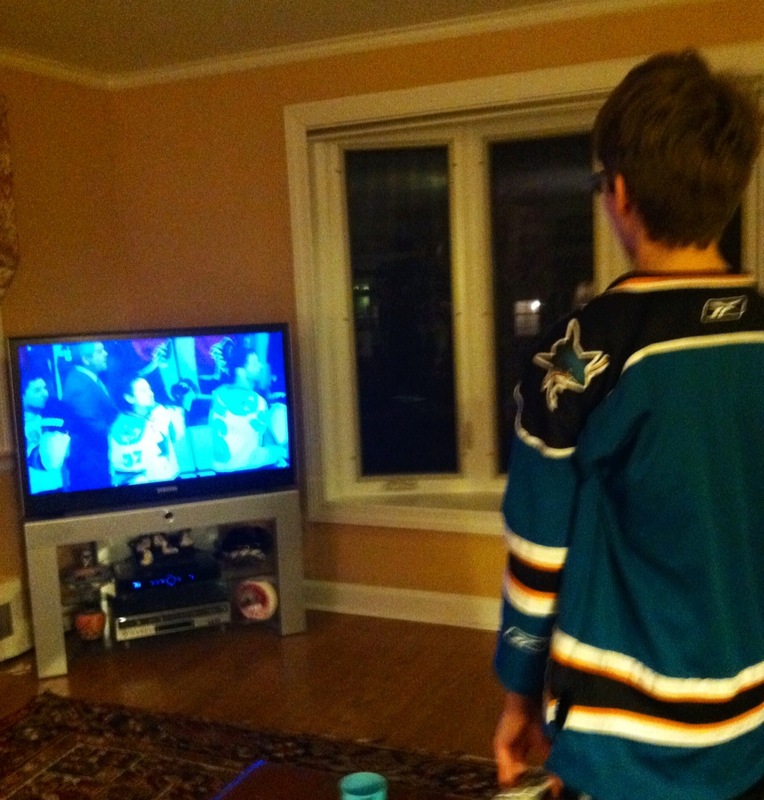 Ryan stands for the national anthem as he watches the Sharks’ long-awaited season-opener. Yes, NHL hockey is back, the season having begun Saturday, some three-plus months late due to a labor dispute. And I am confident in saying that no one was more excited than my son. Others may have equaled his excitement, but nobody surpassed it. Saturday, he planned to watch all 13 games, starting with a doubleheader on NBC at 3 p.m. I showed him how to find the game that wasn’t on in our area on his iPad. He went into his collection of jerseys and selected a Vancouver Canucks model. Well, I’m glad you did. It took me a minute to figure it out myself. His beloved Sharks didn’t open their season until Sunday, so he wore the Canucks jersey because Vancouver was facing the Anaheim Ducks, San Jose’s rival and Ryan’s most-hated team. That game, scheduled for 10 p.m., would conclude the day. Ryan promised to stay up to watch. For a child that rarely makes it past 9 p.m., that was a tall order, and one he ultimately fell short of. Veronica talked him into going to sleep so he’d have energy for Sunday’s games, including the Sharks’ debut at 6. That was probably a good thing, too, as the Ducks ended up blowing out the Canucks. Sunday, he emerged from his room in his Joe Thornton t-shirt, teal Sharks jersey, and a “fired-up” attitude, as he described it. He wanted his attitude to carry over to the Sharks. He had a friend over to watch the early afternoon game. Another was supposed to come for the Sharks game, but had to cancel due to a family obligation. Ryan was very disappointed but we eventually got him to remember that he had been waiting nearly nine months to see the Sharks play again, and that nothing should get in the way of his enjoyment of it. Ultimately, he agreed, and by puck drop, he was raring to go. He treated the game as if he were in the stands, rising for the anthems and singing along, yelling and cheering as if he were sitting by the glass instead of his living room, 2,000 miles away. San Jose was playing Calgary, and the Flames got off to a quick start. That had four shots on goal in the first minute, leading to a brief panic that they might hit 30 for the period. Calgary scored first, but the Sharks came roaring back to win, 4-1, putting an excellent cap on the opening weekend of the NHL. As many times as I have watched my son get absorbed in a game, whether at the arena or on television, I never tire of it. To see him watching hockey is to see him at his happiest, completely wrapped up in something he loves. I am so, so glad to have these moments back in our lives. I’m so glad it’s back. 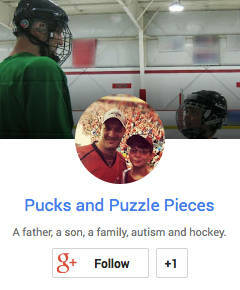 I thought about you guys this weekend whenever I heard news of hockey or passed it while surfing with the remote. Thanks for thinking of us. It really is quite a relief.